The sub-element of Fire (the red triangle) within Earth (the yellow square) as Tattwa symbols, are shown prominantly on the Sigil. Upon the red triangle of Fire is inscribed the glyph for Capricorn, the circle of 4 covens in the ASW to which the OWT Coven belongs. Upward and downward facing triangles meeting in the center with a staff, in bisected white and black to represent the movement up and down the Tree, evolution/devolution, polarity, and light/dark balance of gamos/samos cycle. The white and black triangles are curved denoting the Sigil of Malkuth, the Earth sphere in Qabala. All elements of the Sigil are brought together in a form reminiscent of a warrior’s shield. In Celtic tradition, the world tree was called the Bilos Tree and it was erected in the center of temple spaces to represent the central axis of the world. In Norse tradition, the sum total of the Nine Worlds, as well as the paths connecting them, is the world tree known as Yggdrasill. In Hermetic Qabala, the Tree is a glyph, which represents all states of being and becoming in the universe, known as The Tree of Life. Our Staff represents the World Trees in their many forms. It is the central pillar of the Coven, and is both a powerful magical tool and a work of lasting, beautiful art. Like Yggdrasill, the Staff is made of ash wood and has various stones embedded in the wood, representing the Tattwa Elements in their order of creation. Spiralling around it's length are inlaid veins of Gold and Silver, representing the dynamic movement through the Tree-- Decending into the division of diversity and possibility, and the Rising convergence into unity and integration. The original sculpture of the base is formed of Pewter, cast into the form of entwining roots that spread out into a free standing platform of roots grasping the Earth of Capricorn. The Pewter is an alloy of 5 metals, including trace amounts of Lead and the standard Antimony. The Lead invokes the boundary setting power of Saturn, the Ruling Planet of Capricorn, as well as the capacity to neutralize and block energies that do not serve useful functions. The Antimony is the one metal that is always "awake" and energized on the Earth Plane, providing enhanced manifesting power and scope to the Staff, as well as the ability to cut alway and sever ties to manifestation for things that are not desired or needed. 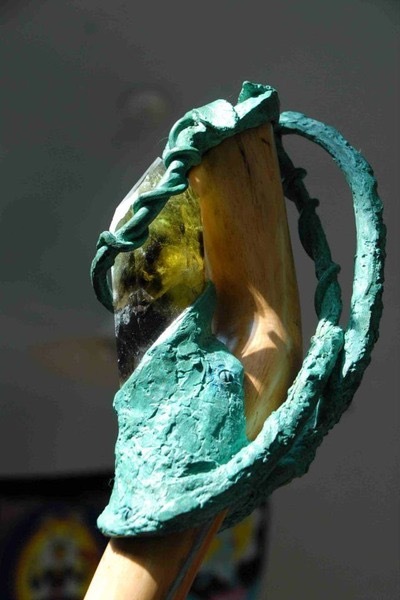 The top of the Staff is crowned with another original sculpture, this time of a patina Copper that secures a large green tinged Smoky Quartz Crystal (see top picture to the right). Copper is, among other things, associated with healing and Venus/Netzach. It is a highly conductive metal which transmutes and conducts the energies of the Higher Plane of Tiphereth (Sun) into an a form of energy compatible with Malkuth (Earth). This enhances the Staff, allowing it to function as a very powerful energy conduit for the wielding of Magick and driving the Manifestation of what is needed and desired. The Smoky Quartz Crystal lends a potent focal point to direct, store, and organize programmed energy patterns in a very Capricornic fashion. In particular, the Crystal excels with the the protection of spaces/beings, the banishing/cleansing of negative energies/beings, and the enhancement of Psychic abilities, most notably Telepathic ones.